Greece beat Germany 78-62 in Belgrade on Sunday to capture the European Championship for only the second time in their history. Roared on by more than 10,000 fans, Greece took advantage of a lacklustre display from Germany, who were forced into 21 turnovers. Greece's star was Theodoros Papaloukas, who scored 22 points. Germany's Dirk Nowitzki, the final's top scorer with 23 points, was named the tournament's Most Valuable Player. 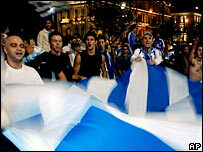 In scenes reminiscent of Greece's victory in football's European Championships in 2004, thousands of fans took to the streets in their home country to celebrate. The main roads in cities across Greece were jammed for several hours. Greece's only other victory in the competition came in 1987 with a team featuring current coach Panayiotis Yannakis. "I am still in dreamland and I can't quite believe that we are the European champions," said Yannakis. "All the players deserve credit for this because they all played their hearts out for Greece. "They all deserve to be treated like heroes but I hope they stay with both feet on the ground. "This is a team of unsung heroes as a different player stepped up in every match to carry our flag all the way to the finish line." Greece caused the first major upset when they beat Russia 66-61 to advance to the last four, after another superb display from Papaloukas. Then came a dramatic 67-66 semi-final win over France, thanks to a last-gasp three pointer from Demetrios Diamantidis. Shooting guard Papaloukas said: "I am at a loss for words after what we have achieved. "I was a little boy dreaming of moments like this one when Greece won the gold medal in Athens 1987." Earlier in the day, France, with NBA stars Tony Parker and Mickael Pietrus in their team, beat Spain 98-68 in the third-place play-off.